[ Mrs Russell Barrington, English artist. ] 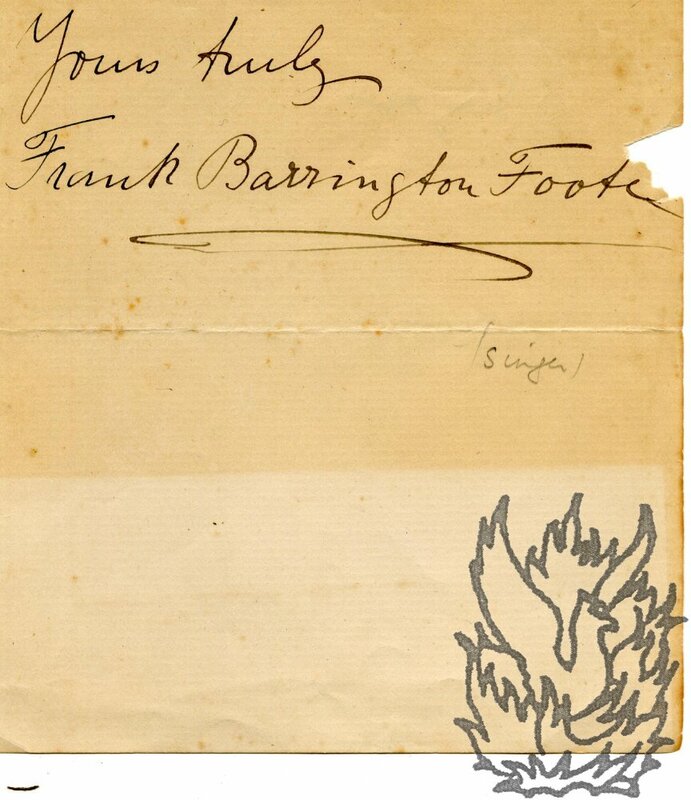 Autograph Letter Signed ('Emilie Isabel Barrington') [ to Fleetwood I. Edwards ], requesting that Queen Victoria donate a sketch by Lord Leighthon to a collection. With copy of Edwards's letter declinging. Mrs Russell Barrington's letter: 4 Melbury Road, Kensington W. [ London ] 16 July 1897. Copy of Edwards's reply dated from Osborne [ Isle of Wight ], 5 August 1897. ONE: Mrs Russell Barrington's letter. 3pp., 12mo. Bifolium with mourning border. In good condition, lightly-aged. 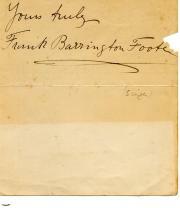 Autograph Signature ('Frank Barrington Foote'). On piece of laid paper (roughly 13 x 11 cm). Aged and chipped. Reads 'Yours truly | Frank Barrington Foote'. Chipping to the outer edge, very close to the last couple of letters of the signature. Foote, who frequently sang with Adelina Patti at Covent Garden, ended his days destitute in New York City.